Julian MacKay at 16 was winning medals at the Sochi and Istanbul competitions when he represented his school, the Bolshoi Academy. At 17 he won the Prix de Lausanne and his Harlequin Floors Scholarship let him spend a year with The Royal Ballet. 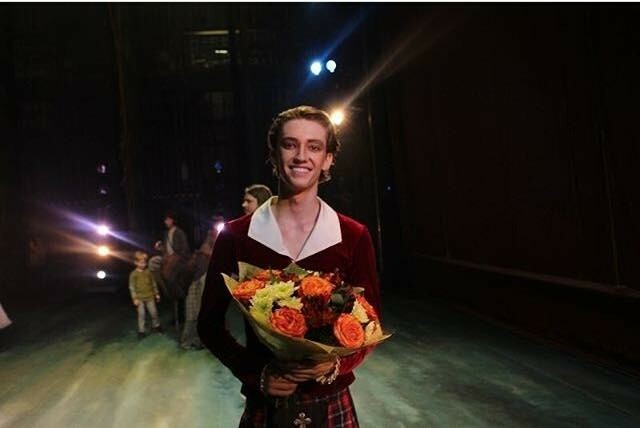 At 18 he was snapped up as soloist with the Mikhailovsky Ballet and after six months with the company was given his first principal role in a full-length ballet: James in La Sylphide, which he danced just after his 19th birthday. I came to the company with the promise of being a soloist and dancing all the soloist roles. I trusted Mikhail Messerer and am so grateful that he trusted me with James so young. Julian was dancing with Vaganova-trained Ella Persson from Sweden, also making her debut. This was her first time dancing La Sylphide also. She was a lovely Sylph, and we had great reviews from the Russian press. Another pair of dancers… further emphasised the ballet’s romantic traits: the recent Vaganova Ballet Academy graduate, the Swede, Ella Persson, and Julian MacKay, the American who studied at the Moscow State Academy of Choreography. The Mikhailovsky pushed down on the accelerator as soon as young Julian was on board. It’s my seventh month working at the Mikhailovsky Theatre and I have been given the opportunity to dance so many roles it’s hard to remember them all, it’s been quite a whirlwind. I also danced at the end of last season as Frondoso’s friend in Laurencia with Ivan Vasiliev… that was a fun ballet! At the beginning of this season he was given his first principal role in Cipollino as Count Cherry, and was a Harlequin in Nacho Duato’s Romeo and Juliet… and then came James. James is a very difficult role stamina-wise and the only way to get more is to do it more, so there were a lot of rehearsals and a lot of sweat. Apparently, some in the audience were moved to tears. As a dancer who loves acting roles in ballet, I am really happy to receive these kinds of reviews. One of my favourite parts playing James is when I collapse at the end. I don’t actually die but I go crazy and I think this is the part that affects the audience the most because there is no happy ending. When the ballet was created, this symbolized the victory of pagan gods over Christianity – how Madge the evil witch destroys James’s life. For me, I really can understand James, because he is torn between two worlds – one that is real and one that is fantasy – which is something that you always try to pursue in ballet… always pursuing perfection, the impossible. All four of the Khan-MacKay dancing tribe are torn between two worlds: that of rural Montana with its big skies and wide-open spaces where they were born, and that of the various international cities that they’ve called home since forging careers in the ballet world. Julian’s also been exploiting the excellent Russian coach-mentor system. The unique thing about Russian theatre is that you have a coach to prepare your roles with, which helps greatly, especially when it’s your first time learning a lead role in a ballet. …such as throwing the berries out of the Sylph’s hand and trying to catch them. Misha Sivakov coached the stamina aspect of it and helped me put it all together. I feel like the unique style that I received from my coaches is both Bournonville and Russian: Russian style for the upper body and Bournonville for the legs. I have fulfilled my dream, and am very grateful to Mikhail Messerer for trusting me with this opportunity to premiere in his restoration of La Sylphide. Julian’s recently been dancing his first French Doll in Nutcracker and another performance as James. I am preparing several more principle roles already, and hope to dance them in the next few months. I recently made my debut as choreographer and director with my children’s ballet The Little Humpbacked Horse – the Untold Story of the Magic Pearl which was sponsored by the Four Seasons Lion Palace in Saint Petersburg. It was a lot of fun and a great success. I’ve also just signed with IMG Worldwide in NYC, so will be doing more work including, hopefully, acting in films in the future. You ‘grew up’ in Moscow… how’s life on the ‘west coast’? I have met a lot of great people in Saint Petes, both in and out of the theatre; it’s a very creative and friendly city. My brother Nicholas and I recently shot a short film around the city in the snow… cold but beautiful! This is Leonidas, our French bulldog puppy. My brother Nicholas and I got him at a dacha outside of Saint Petersburg. 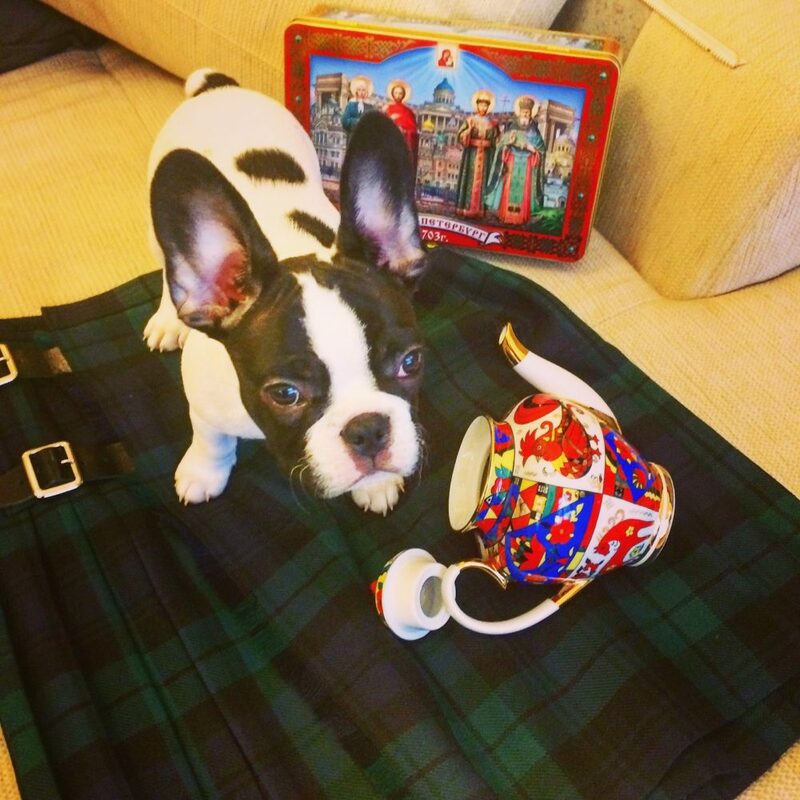 He is sitting on my real kilt – for the clan MacKay that I am a part of as my father is Scottish! How fitting that “James” is portrayed by a very young dancer–the character’s delusion is so much more credible. Best wishes for continued success! Great interview with such wonderful “personal” touches. We get to know Julian as a man and an artist. Graham, thanks for this beautiful interview. 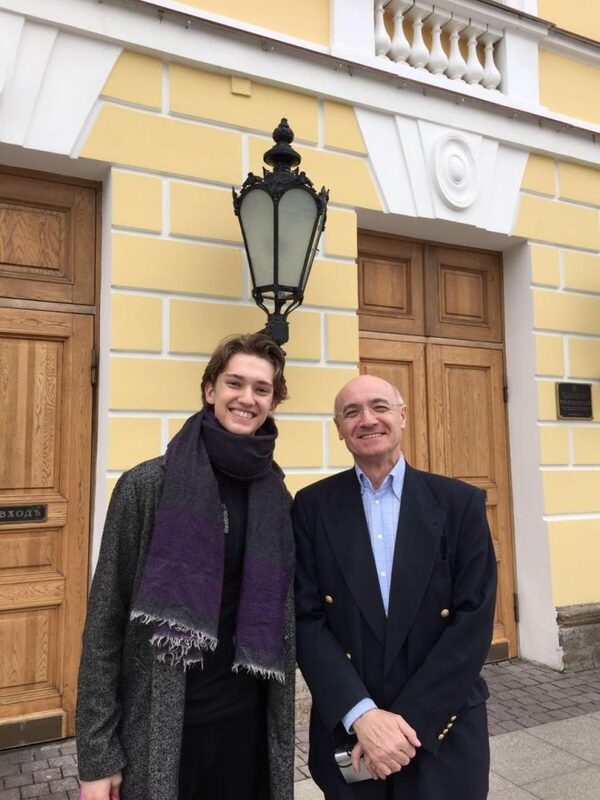 Julian is such a nice person and Mikhailivsky is one of THE finest theatres in the world!